Select the wrist size closest to the actual wrist size, against the skin without adding extra. We will custom size the magnetic bracelet a bit(3/8" - 3/4") larger than the wrist size you select so it fits comfortably. To get the wrist size, measure snugly against the skin where the arm meets the hand with a soft tape measure or a string and a ruler. Do not add extra to your actual wrist size. 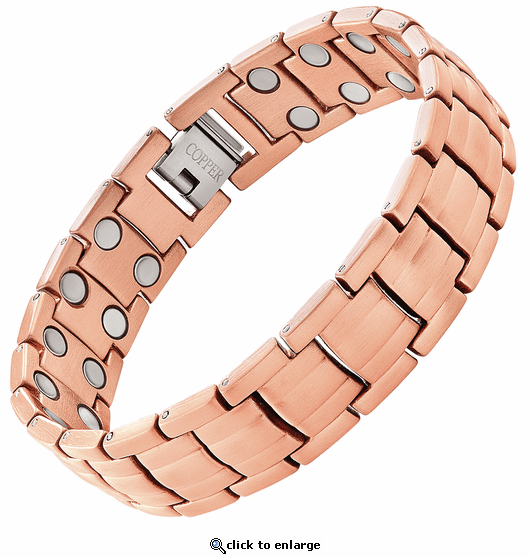 This is a solid copper link magnetic therapy bracelet. Finally real copper in a link style bracelet. This copper link bracelet offers double the power with 2 powerful & permanent 3300 gauss neodymium rare earth bio north facing magnets in each link. Order yours today. The bracelet is super. Well made and it is very comfortable to wear. Very pleased with the ordering and shipping. A very classy company. I am very pleased with my purchase. It looks good and wears well. Great quality and good looking bracelet. Excellent customer service. I bought it for my husband and he is very happy with it. Very well made and comfortable and the shipping was prompt with good packaging. I really like the looks of the bracelet. Buying the bracelet from MJS saved me almost 50% over some other stores for the same or similar style. Bought the bracelet for a surprise for my husband. It fits perfect and he loves it. The bracelet fits just right and it definitely helps the arthritis in my hands. The double magnets make a difference as well as the copper and the bracelet looks great also! I just love my new copper bracelet. I like that it has double links with double power. as long as it helps with pain. I've been buying magnets since the late 90's. Thank you for my extra ring. I think I will love this bracelet. I purchased a stainless with magnets before and it has helped with the arthritis in my wrist. This time I measured my wrist too tight and the bracelet was too tight. Even though it was my fault they are sending me another link to have added. Was going to fix it if I sent it in or send me the link. Also extremely nice correspondance. Will definitely purchase from them again. It's a Christmas present so I cannot give a good review, It seems well made and size looks OK. Weighty, handsome, sturdy, well made. A mans bracelet. I wear it all day long, including the golf course. Bought this bracelet in a small for me. I'm a woman but loved the bracelet. It proved too big. So I gave it to a friend of mine and it just fit him. He loves it! I saw the brand new link one and ordered it - returning the cuff ones. I love this one and it has a double magnet on each link which must be better. I will probably get another one for the other arm. I have worn MJS bracelets for eyars and they are a big big help my arthritis in wrists and fingers. I highly recommend. This was a step up for me and I glad I made it. This bracelet is head and shoulders above what I have been using for years. People ask me if it helps and can I see a difference while wearing it, I explain that it's when I don't wear it that I feel the difference. I might add that the shipping was quick and a pleasure to deal with the staff. I love it. It is sturdy, very handsome, works wonders and is always there. I am going to purchase another one for my other arm.